Holly Calica, Co-Founder of Luna Nueva Wellness Collective and Kalingafornia Laga, brings her experience as an educator, artivist, and herbalist to the San Francisco Bay Area by promoting Healers of Color, traditional healing practices, and mentoring budding herbalists. Descended from Ilocano and Pangasinan grandparents from the Philippines, her work crosses media, culture, local community organizing and International solidarity work. Her unique background as a Cultural Worker preserving Indigenous traditional knowledge, skills and practices lends itself to participating in the revitalization of ancient practices in communities of Color to overcome generational colonial abuses and trauma. 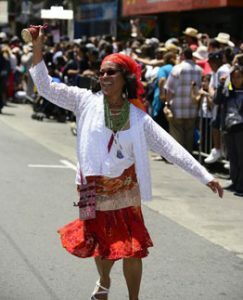 Her training in family bodywork through “Te Rongopae - A Clear Bright Horizon” and “Kawa Ariki - The Goddess Returns,” along with her nearly 30 years of experience in Philippine and African Diaspora dance practices and 40 years as a practicing visual artist, have been the foundation of her well being. She revels in teaching about plant medicine, self-massage bodywork, dance, art and spiritual healing with the community in order for everyone to learn about self-care and self-healing. She has spent the last five years collaborating with others to provide holistic and integrated care in private practice, clinical work and educational forums.